The Bombay Development Directorate's chawls were built in the 1920s to house textile mill workers. Some were built as prisons, then converted into military barracks and later low-cost housing. Madhuri Dewar remembers her wedding in 1981 in the tenement building where she had lived all her life: guests sat in the colourful tent in the courtyard, packed the corridor and squeezed into the one-room home she shared with her parents. Today, Mrs Dewar, 65, lives with her husband in the same room in a Bombay Development Directorate (BDD) chawl - a building divided into small rooms with shared toilets - in central Mumbai. Her two sons and their families live in two rooms across from her, and the families walk into each other's homes all day. 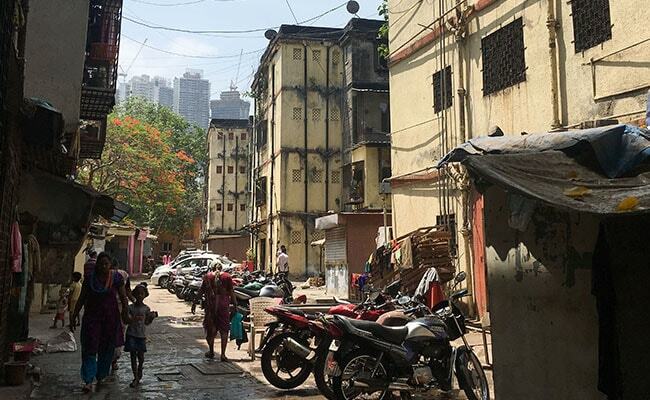 Now city officials are set to redevelop the colonial-era BDD chawls in four locations in south and central Mumbai. "We have lived here for so many years. My family is here, all my neighbours are friends," said Mrs Dewar. "We would like to have bigger homes, become owners, but we do not know if our lives are going to be the same after the redevelopment, if we will all be together like we are now." About a third of India's 1.25 billion population lives in cities, with the numbers rising every year as tens of thousands of people leave villages to seek better prospects. Up to 37 million households - a quarter of the country's urban population - live in informal housing including slums and chawls because of a critical shortage of affordable housing, according to social consultancy FSG. Mumbai's BDD chawls were built in the 1920s to house textile mill workers. Some were built as prisons, then converted into military barracks and later low-cost housing for migrant labourers. More than 16,500 families live in the four BDD chawls spread across more than 93 acres of land in prime sites. They pay a monthly rent of about Rs 18-20 each. The rooms have been modified by families over the years, some carving out a kitchen and a toilet as their means improved. The chawls -- in close proximity to offices, schools and public transport -- are rare enclaves of affordable housing in a city with some of the most expensive real estate in the world. There is a shared open courtyard where children play and festivals and weddings are celebrated. In the corridors, washing is hung and children's bicycles parked. Plans to redevelop the chawls in the space-starved city have been made and shelved repeatedly over the years as governments changed and residents opposed the plans. Now, the buildings are so dilapidated that they must be knocked down, officials say. "The buildings have outlived their life spans," said S.D. Lakhe, vice chairman of state agency Maharashtra Housing and Area Development Authority (MHADA). "These people deserve safer, bigger homes with better amenities," he told the Thomson Reuters Foundation. States are rushing to meet a "Housing for All" target by 2022, which aims to create 20 million new urban homes and 30 million rural homes. The plan for the BDD chawls is to give tenants two-bedroom flats measuring 500 sq ft each in high-rise towers. A third of the land will be developed and sold commercially to help meet the project cost of more than $1 billion. Residents say officials reneged on a vow to let them pick a developer, instead floating tenders without informing them. Also, only tenants who can prove they lived there before 1996 are eligible for a new flat. Anyone who owns property elsewhere in Mumbai is barred. Several residents' associations have filed petitions against the plans. "MHADA did not take us into confidence and are going ahead without our consensus. This is a violation of our rights," said Raju Waghmare, a spokesman for residents in the Naigaon chawl. Public hearings were held for chawl residents, and contracts were given to builders Larsen & Toubro and Shapoorji Pallonji following a "transparent and thorough" procedure, Lakhe said. The redevelopment of the BDD chawls is second only in scope to the long-delayed plan for the Dharavi slum, home to about 1 million residents and hundreds of small businesses. That plan too, was criticised for ignoring the needs of poor migrant workers who have lived there for generations. Activists say the government's focus on creating Smart Cities with internet connectivity, uninterrupted power and efficient public transport will hurt poorer residents including those in slums and chawls. Mumbai's chawls help meet the affordable housing needs of the city, and foster a sense of community and inclusion that eludes low-income workers and migrants of religious minorities, said Sameep Padora, an architect who has studied chawls. "Creating affordable housing is not merely about adding square footage area; it is also about maintaining the social fabric and about sensitivity to the needs of people who do not have many options," he said. Shiv Sena Worker Gives Up Mumbai Flats Won In Lottery Over "Bad Vaastu"